Great news – by the time you reach this form, you’ve completed the first phase of your divorce. As the respondent, you’ve completed your response (FL-120). If you are not a respondent and/or have minor children, you will want to choose the correct path for your circumstances. You’re no stranger to the top of each form by this point, and we’re continuing on with our sample respondent Jane Smith. Don’t forget to include your case number on the right side. Tax year: If you last filed taxes in 2014, that means you filed for tax year 2013. In our sample respondent Jane’s situation, she filed her taxes in spring of 2016 for the 2015 tax year. Don’t be intimidated by this next section. The key is to be as factual and thorough as possible. Starting at the top, you’re going to list everybody that lives with you, along with their age, their relationship to you, how much money they earn each month. Finally, check the box that corresponds to whether or not they contribute to your household expenses. For most, it’s the kids that live them, and they don’t work. If they do work, the kids don’t usually contribute to the household expenses, so this is relatively easy to complete. This is the case with sample respondent Jane as seen in the above example. 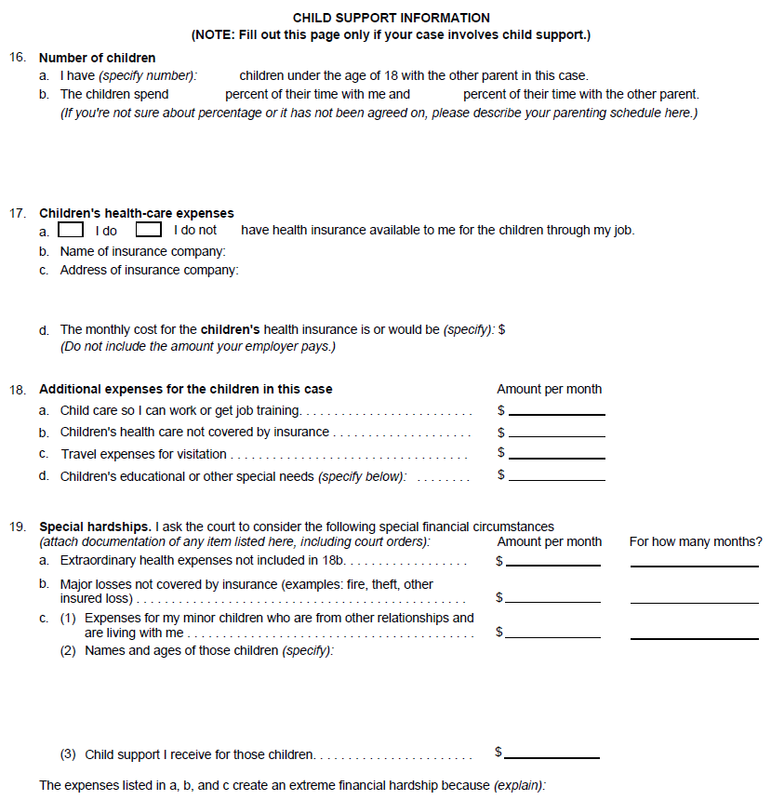 If you have minor children of the relationship, you are going to complete this page. We’ll detail each step below. Our sample respondent Jane has 2 in her marriage. Input the number you have, followed by the percentage of time they spend with you and your spouse. If you’re not sure of the percentage, you can describe the arrangement in the space provided.